Maybe, dear homeschool mom, it’s time to “make over” your day! The two times each year I (am tempted to) change up my schedule or routines or habits are in the beginning of the school year and the beginning of the calendar year. It is at those times that I’m either planning for new activities and events, or tired of the same ol’, same ol’; either dissatisfied with what I am accomplishing, or frustrated with what I’m not getting done. Over the years, I’ve tried different plans and programs, different ways of being more efficient or getting a head start on my days. You would think that I’d get discouraged when things don’t continue to work out, or that I’d even give up my attempts at self-improvement. Some of us are morning people, others are night owls, others have perhaps just a few hours during the day when they’re at peak efficiency. It doesn’t really matter when you work best, just that you learn how to use that time to the best of your ability. After all, we each have a finite amount of time in life, and none of us know just how much. Mis-using that time is not only poor stewardship but just plain wasteful! So why should we keep on keepin’ on…experimenting or trying yet again another plan or system? Seasons change – You know what I mean. Having little ones…pre-schoolers…first starting school…adding in music lessons and drama camp…maybe a new baby, or a job change or a move. Our lives are constantly in flux, our environment and situations change even if we don’t change our mailing address. You change – Are you the same today as you were last month? Last year? Five years ago? Of course not! And that may be the very reason that something you started using last year or five years ago may not be working for you anymore. Whether it’s the format of your quiet time, how you’re planning your personal time or even your homeschooling schedule, your needs will change as you change and grow as well. Materials change – There are always new approaches to the process of self-improvement. Different people have different ways of looking at things, and different ways of attacking problems. What works for some doesn’t work for others, and even more so, what works for someone at one time may not work for that same person at another time. Trying something out that doesn’t “work” isn’t bad – if you look at it as a way of discovering what materials or methods are relevant for you at the particular point of your journey you’re at. What I have found is that seeking God’s wisdom for whatever you choose is key! God may have a new or different lesson for you – Related to the change of seasons and our own growth, God presents the situations (and solutions!) that we need, to learn what we need, when we need to learn it. Practicing discernment, keeping an open heart and mind to God’s will for our lives, and asking Him for clear direction are all ways we can discover what He has for us to learn at any given time. You may be modeling perseverance for your kiddos – That’s a lesson that I have most definitely been learning most recently. The challenges I’ve had to overcome, the skills I’ve had to develop, and the new approaches to marketing and networking that I’ve had to learn as I’ve been growing my own business have provided me with a myriad of opportunities to call it quits! But as my children see me work through something, keep at it for awhile, decide if it’s something that “works” for me or not, and then move on to another system if and when necessary, they, too, are learning to discern with wisdom in their own lives. One of the tools I’ve tried recently to improve the use of my morning time is the Makeover Your Morning program from Crystal Paine* (aka Money Saving Mom). When my first two children came along, I started my own personal transition to becoming a morning person. Even thought that’s been almost 30 years ago, I still struggle with embracing that aspect of my personality. And that’s even though I recognize that my prime working time is before lunch (and even better, before the kids get up!). I discovered Money Saving Mom upon launching a search for ways to tighten up our family budget. But I tackled Make Over Your Morning after I realized that Crystal Paine is “the real deal” and trusted that if she could help me effectively save money at the grocery store, she could probably help me tweak my time management skills, as well! Make Over Your Morning gave me the tools I need to make the best use of my time and helped me to discover a morning routine that works…for ME. I am so grateful I didn’t throw in the towel when my other earlier efforts didn’t pan out, or I grew out of them. 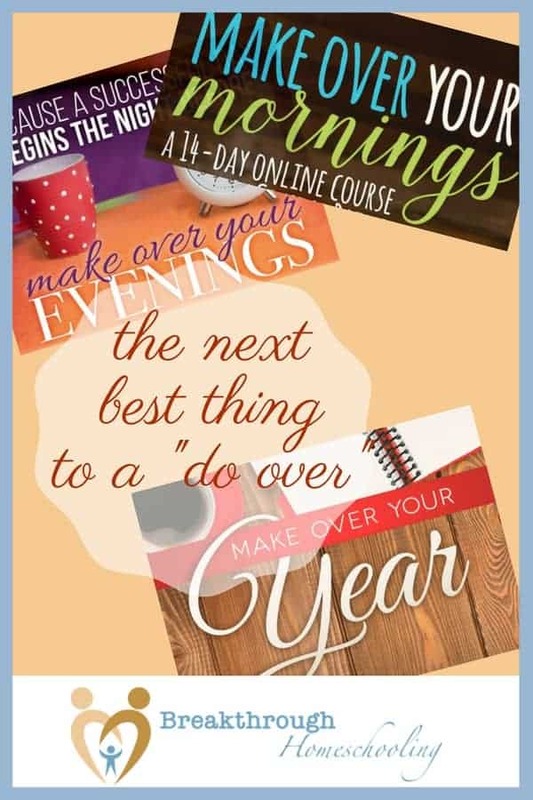 Go ahead, homeschool mom, make over your morning…or your evening…or your year – today! * And did you know that Crystal is not only a homeschool mom but a homeschool graduate as well? !